Sunday, March 25, we were at the picnic area for the first time in a week. Two pair of osprey were circling around the treetops. One pair had taken up residence on one of the osprey nesting platforms in Presley Creek adjacent to Lot 52. Osprey . . . also called “Fish Hawk.” Scientific name Pandion haliaetus. The flock of Canada Geese normally in Presley Creek was nowhere to be seen or heard — probably inland feeding. A group of 16 Bufflehead were in the Potomac about 100 yards offshore, feeding. 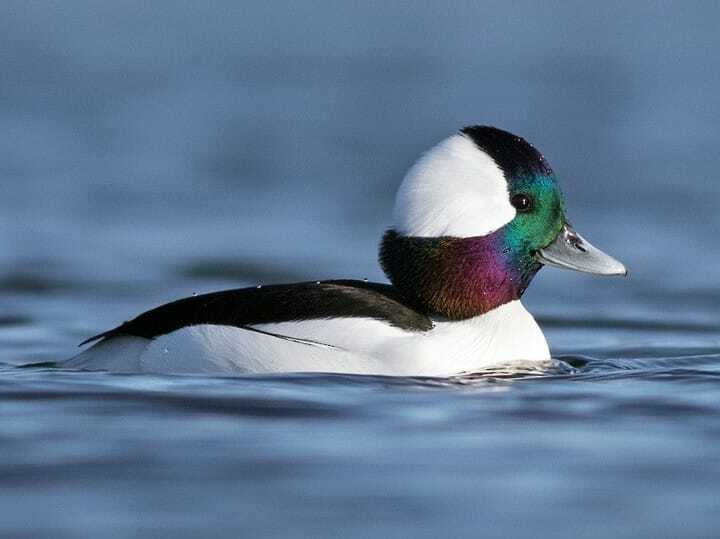 Bufflehead; scientific name Bucephala albeola. Winter storm on the way!!! As of Monday night, March 19, the weather forecast for our area calls for 5 to 8 inches of snow on Wednesday. Rain beginning late Monday night, rain all day and night Tuesday, changing to snow on Wednesday morning. Winds will be out of the NNW at 10 to 15 MPH with gusts to 40 MPH possible. Watch the Heathsville weather forecast at this link. We will post updates if anything changes. Everyone is invited to the alpaca shearing!! A traveling Australian crew shears the alpacas — it’s very interesting to watch. The alpaca coat is two layers of wool — a rough outer layer and a soft, warm inner layer. After the wool is sheared, the two types of wool are separated. Very warm gloves, socks, mittens, and the like made from the inner wool will be for sale. There is no charge to watch the shearing. Bring your camera or video camera. Please park as far off the road as you can. If you have a dog, please leave the dog at home or in the car so as not to stampede the alpacas. 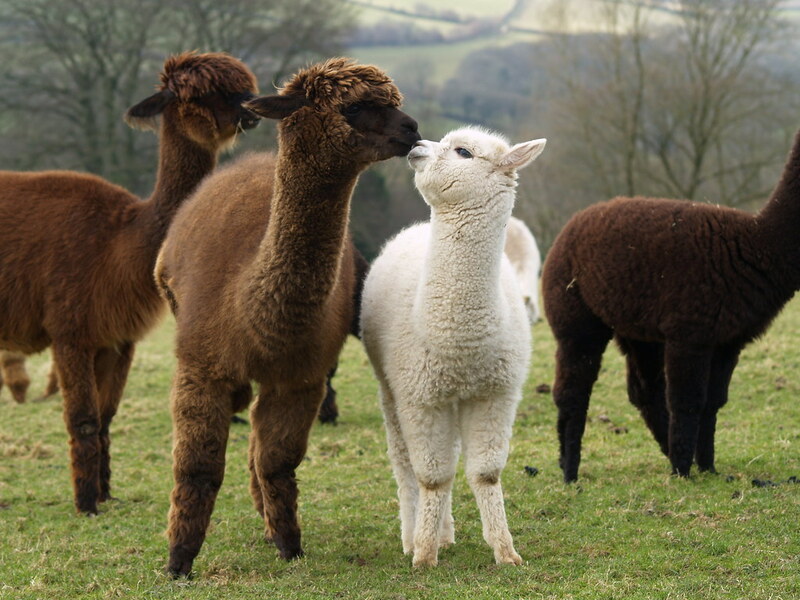 Alpacas before shearing . . .
DAYLIGHT SAVINGS TIME BEGINS AT 2:00 AM, SUNDAY MORNING, MARCH 11. SET YOUR CLOCKS AHEAD ONE HOUR. That is, if you are setting your clocks at 11:00 PM, Saturday night, March 10, set the clocks forward from 11:00 PM to 12:00 midnight. If you do not set your clocks Saturday night, and wake up at, for example, 7:00 AM Sunday, March 11, set your clocks ahead to 8:00 AM. If in doubt, turn on your tv set and check the time there — set your clocks and watches to match the tv time. Or, check the time on your cell phone — the cell networks will automatically set the time to Daylight Savings. OR, you can check the US Naval Observatory Master Clock. Current weather forecasts for the East Coast indicate another severe winter storm is possible for areas of the Northeast. However, our forecasts are for cold weather, alternating among cloudy, partly cloudy, and sunny with rain and possible snow Monday and Monday night. Here are the specifics. Cloudy with periods of rain. Snow may mix in. High 41F. Winds NNE at 10 to 15 mph. Chance of rain 90%. Rainfall near a quarter of an inch. Snow showers early. Breaks in the overcast later. Low 31F. Winds N at 10 to 15 mph. Chance of snow 70%. Snow accumulations less than one inch.